For me, a lot of that is due to Russell Crowe’s performance. Plus, a director (Ron Howard) allowing Russell to do what he does best – with a paucity of special effects that compete with his performance. I agree. Russell Crowe is a true actor in the grand Hollywood sense. He has the talent, charisma, and looks to be a leading man. (And he is.) But he takes on roles, and becomes the character in them, like a character actor. And I love character actors. Quite often, they are the characters I watch in a movie, or in a television show. The lead actors may carry the day. But it’s usually the character actors that give a production depth and re-watchability. Russell Crowe’s vitae (from IMDB) contains an impressive list of films, covering a wide range of roles. And speaking of impressive, I recommend that you buy/watch the two-disc edition of A Beautiful Mind. I am astounded by how special-effects artists create movie magic these days. I don’t mean movies that essentially are CGI special effects. I mean movies that use special effects sparingly and seamlessly to create images on the screen that enhance – but not detract from – the story. Such a balance is extremely difficult to attain. But the master craftsmen who workd on A Beautiful Mind attained it. One more thing before I dive into the movie: James Horner’s score. Horner has composed music for some of my all-time favorite movies: Field of Dreams (1989), Braveheart (1995), TItanic (1997), The Devil’s Own (1997), and The Spiderwick Chronicles (2008). James Horner is one gifted dude. His score for Field of Dreams, alone, makes him one of my favorites. Horner specializes in swelling, emotional themes that not only tug at the heart strings, but pluck them all in perfect harmony. 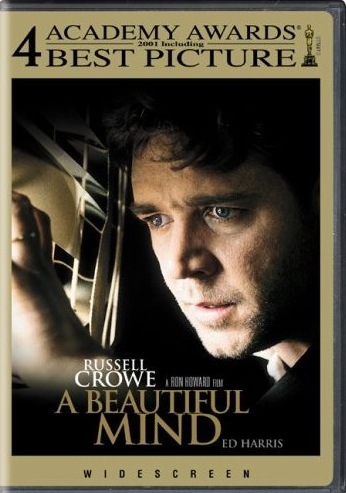 A Beautiful Mind is based on the true story of John Nash (Russell Crowe), a brilliant mathematician who – at the height of his abilities – loses his mind to schizophrenia and paranoia. But he doesn’t know it’s happening. And the audience doesn’t know it’s happening. But this isn’t the story of a man losing his mind. It’s the story of a man discovering his heart. In the movie, the speech John Nash gives when he accepts the Nobel Prize for economics in 1994 is one of the most moving captured on film. The gratitude and devotion he expresses for his wife, Alicia Nash (Jennifer Connelly), chokes me up in a big way. Despite its title, A Beautiful Mind is a story about the redemptive, and restorative, power of love. Since this movie is just a little over two hours long, it’s likely to be in three acts, which makes it easier to analyze than a movie in, say, five acts or seven acts. So I’ll take a look at this film and apply the principles of the three-act structure to it. Let’s see if all the major turns fall where they usually do for a movie written in three acts. So, okay. Which is it? The entrance of John Nash’s roommate. The conversation Nash has with Charles on the rooftop is key to understanding John Nash’s motivation. His declaration that he needs to find an original idea is the desire that drives him, pushes him. It becomes his mania. But it didn’t happen to him or because of him. It’s merely a revelation – voiced out loud to Charles – that reveals his innermost fears and desires. But would he have said it if not for Charles? No. Charles was necessary for him to say it. Final answer: The entrance of Charles Herman. Plot Point I: is set up at the 27:35 mark when Nash, offering code-breaking assistance to a group of top officials at the Pentagon, looks up from a map and sees William Parcher (Ed Harris) looking down on them from a shadowy position above. “Who’s Big Brother?” Nash asks. The officials don’t answer. The pay off for Plot Point I is meeting Parcher. This happens at the 32:30 mark. Nash has just left a building. The door slams behind him. He shuffles along the sidewalk. “Professor Nash,” a voice calls from behind him. He turns and sees the man he referred to as “Big Brother” back at the 27:35 mark. The man introduces himself as William Parcher and shows Nash a DoD badge. At the 36:30 mark, Parcher tells him: “You see, John, what distinguishes you is that you are, quite simply, the best natural code-breaker I have ever seen.” In short, Parcher just hired Nash to be a spy for the DoD. Meeting Parcher spins Nash off in a different direction, alters the course of his life. Mid Point: This occurs at the 1:05:06 mark when Dr. Rosen (Christopher Plummer) emerges from the shadows at the top of a flight of stairs and tells Professor Nash not to make a scene. Dr. Rosen declares himself to be a psychiatrist who wants to chat with Professors Nash. Just before Nash is struggled to the ground and injected with a sedative he screams for help, “They’re Russians!” he says. “Help! They’re Russians!” Students and faculty watch in amazement, not sure what to make of the situation. The hardest scene for me to watch is one hour and 20 minutes in the story. John Nash is strapped to a bed and subjected to electro-shock therapy. Dr. Rosen tells Alicia he’s prescribed ECT treatments five times per week for 10 weeks. Electro-shock therapy, to me, seems akin to bleeding the sick, or covering them with leeches, or giving them lead. The medical community seems to think it’s an effective form of treatment. But I think I’d rather have leeches. Plot Point II: This occurs at the 1:38:23 mark (98 minutes, 23 seconds) when John Nash admits to his wife that one of the people he’s known over the years, a young girl named Marcee, can’t be real because she never gets older. This breakthrough in his ability to separate reality from fantasy sets in motion a new chapter in the life of John Nash. ALICIA: You wanna know what’s real? ALICIA: This. This is real. Maybe the part that knows the waking from the dream, maybe it isn’t here. ALICIA: I need to believe something extraordinary is possible. Act II ends at 1:45:30. Act III is short. But it packs a powerful punch. The giving of the pens (around the 2-hour mark) to acknowledge intense respect and admiration is enough to warrant another citation from the Tears Police. It’s a touching moment. But that doesn’t hold a candle to John Nash’s Nobel-Prize acceptance speech in Stockholm in December, 1994. I’d transcribe it here. But it should be seen, and felt in its proper context. Russell Crowe won an Academy Award for his role in Gladiator. He was nominated for his role in this movie, but didn’t win. I’m not sure why. This was a superior performance. A Beautiful Mind was nominated for eight Academy Awards and won four: Best Actress in a Supporting Role (Jennifer Connelly), Best Director (Ron Howard), Best Picture, and Best Writing, Screenplay Based on Material Previously Produced or Published (Akiva Goldsman).